Your accessibility questions answered by industry experts. As education technologists, it’s our responsibility to provide students with the services they need to fulfill their potential. 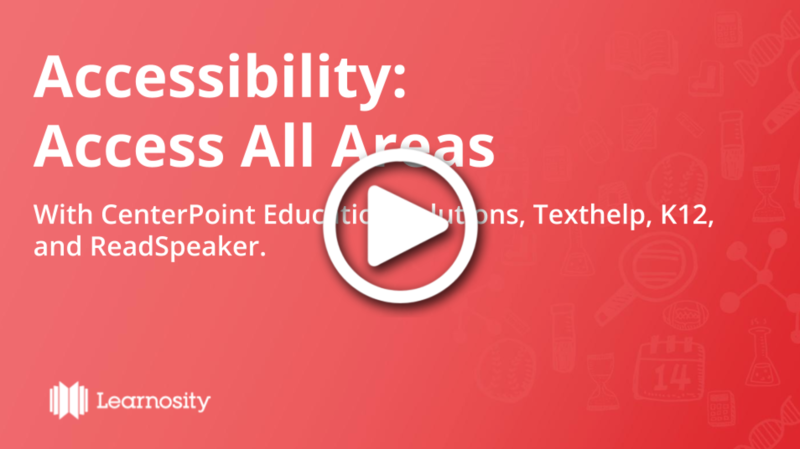 On March 20th, 2018 Learnosity hosted a webinar on accessibility in edtech, where we were joined by a panel of industry experts from CenterPoint Education Solutions, ReadSpeaker, K12, and Texthelp. You can check out a recording of the full webinar below. Q: I’m a Coordinator of Learning Technology at a higher ed institution. Could anyone share their experiences with accessibility in teaching a computer programming class? I’ve never taught a computer programming course but I know from an accessibility perspective that it’s one of the easier things to make accessible because computer programming is primarily text-based behavior. The text has got really defined rules around how it should be structured. I’m not a teacher so I can’t really comment, but I know it should be a perfectly doable thing. Again, I would defer to Fredrick on this! I totally agree. I think the difficult part is when children in school start on programming – that beginning phase. There are so many methods to teach programming that are graphical. There are coordinate systems controlling robots, etc. I think the hard part when it comes to teaching programming is that beginning phase and not the more advanced stuff. What I do hear from some students at university is that they sometimes get stuck because the teacher thinks they should use the same tools some of the others. They might use a graphical user interface for programming that might slow them down a bit when they should maybe use the command-line alternative. Essentially it’s still the same programming. I think that highlights quite an important principle. You must not necessarily do as everyone else. As long as you can achieve the same result, I think that’s what’s important. The one thing that I would say actually, Fredrik, is that maybe the choice of language to teach is important at the start. If accessibility is important, don’t start with Scratch. Maybe start with Python or with a text-based language rather than a graphical language. If it’s for younger kids I’d suggest starting with Python because they’ll understand it. It might take them one or longer to get it in Python that it does to get it in Scratch, but they will get it. One of the things I think we have to do, as educators, is to analyze the kind of baggage that we carry with us. It’s very possible that if we think of this in a “universal design” kind of mindset or a framework, that we’re going to be able to come up with a solution. Recognizing that some people are going to be learning to use their text-to-speech or their screen reader or something similar when they’re beginning. Figuring out a way by either using a text-based programming language first or by not utilizing things that are completely visual but that are multi-sensory – those particular kinds of techniques are drawn from universal design and they make it a whole lot different. But you have to be willing, even in higher education, not to carry the concepts of “this is the only way that it can be done or presented”. Q: How could we address situations where it is impossible to make certain apps accessible for people with a certain type of disability? How could someone successfully teach a visually impaired person something that requires vision to understand? I’ve been trying to take a course by audiobook on particle physics and I found the lack of ability to look at diagrams while trying to understand something spatial really complex and difficult for me to do. So I really would love to hear your answer on this, Fredrik. I think the short answer to this is that I don’t think there are many situations where it’s impossible to make an app accessible for every kind of disability. If we talk about doing graphical design, for example. 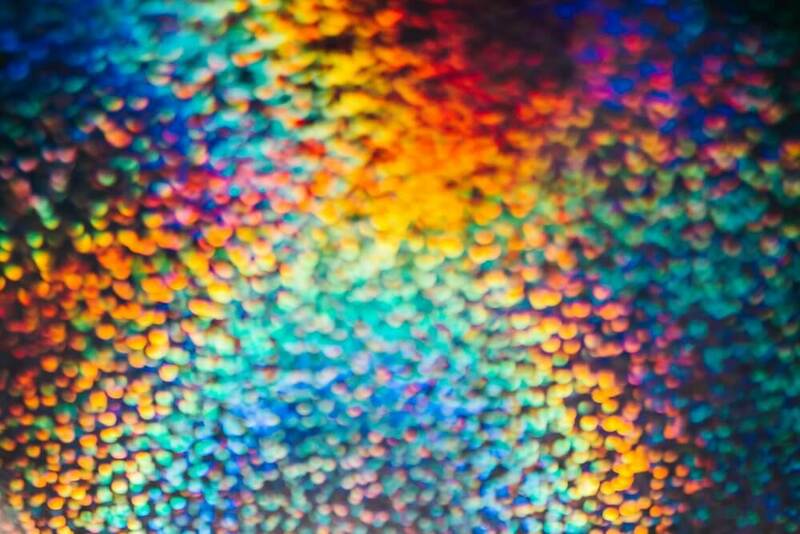 When you can’t see, the difficult thing would, of course, be to know what is beauty to look at. But it’s not difficult to present information in the way that you can build up your inner picture so to speak. I think a lot more is possible than what we believe. For example, I’ve completed a course in computer graphics that was very difficult because I can’t see. However, on the other hand, I had image processing, which made it a bit easier because seeing everything as digits suddenly made it possible to understand why median filter did this and adds to a picture, etc. I remember when we were doing linear algebra, people always drew on paper in geometry and that was fine in one or two dimensions, difficulty-free, and impossible in four or five; but I always used other methods because I didn’t dare to draw. So for me, it was just as easy in two-dimensions as in six dimensions. It really is that mentality thing. I think we can do most things for most people. What I love about what you just said is that it’s about not looking at a disability as what one can’t do, but really turning it back around and thinking about all the positives that come from the difference. When we approach it with that growth mindset, we come with that belief system around accessibility. We should look at what is possible rather than starting in a negative space. If we do this, then we can find ways to make apps accessible to everyone. Believing that we can is a really important first step. Q: What standards do you use to incorporate third-party content (websites, images, textbooks, etc.) into your products? Do you incorporate it with an alternate, remove it, or have other standards? At Texthelp, we’ve got two or three different kinds of products but among our publishing partners we very often get plugged into other people’s content and it just has to work and be accessible. And if it’s not, it just has to be made. Very often, we’ll have to do stuff – you know, they’ll be old PDF files of image-only content, and they just have to be made accessible – they have to be just turned into HTML. Sometimes there will be HTML but text-to-speech engines don’t always get the pronunciation right of the homophone. It’s not always obvious whether a word should be pronounced as “present” or “present”. In those cases, we have to go through the content and put in some audio hints for the speech engines to ensure everything is consistent. If someone is displaying math, we like them to do it in a math ml and if someone is displaying text, we like it to be in real text that you could actually select and that a screen reader can consume. If it’s not in an accessible form, we convert it to be compliant. It’s just going to work. Our stuff is a little bit different. Similar to Fredrik’s approach, whenever we plug our stuff, it gets embedded in the content. So the speech in the dictionary in the picture dictionary tools, they get embedded in the content. The benefit of that being that even if the kid doesn’t have assistive technology, it will just appear for them in the content and it wouldn’t matter if they were on a Chromebook one day or a Windows PC another day or on their iPad at home, it will work. But none of it’s going to work very well if the content is not accessible in the first place. For us all to meet together and overlap and work well together, the established standard is work hard and that’s when we convert the content if it’s not already there. We don’t have the opportunity to do too much work with third-party content, but we do the same thing when we do. We’re using that standard and if something can’t be converted for us, we tend not to incorporate that third-party content. We’re not content providers but if you are a content provider you can maybe think about doing adaptions instead of using the third-party content right off. In our case, you can never get content to be more accessible than it is. I mean, if you have third-party content that is not accessible and you include it in an ever-accessible platform, you will still not be able to get it accessible. The hard part is, of course, if you include accessible content in a non-accessible way – that could happen in the browser history with iframes, etc. – if it is possible to get the third-party content in another format or through APIs, you have more control over the presentation or within your platform that might help. We have third-party content as well as our original content and just recognizing that people enter or start from different places still – it’s like what Martin said – the journey or the way that it’s viewed if someone you know challenges it is that what CAC element is there. So we tend to CAG is really what you need to think about as far as the entry of third-party content. Q: Is it more effective to train everybody in a company with a base level of accessibility so or have a few accessibility specialists for each role (devs, QA, UI/UX) that have a deeper knowledge? We train all staff on Disability Awareness so that they’re fully aware of how different disabilities impact ability and their relative commonness. We train all QA and Developer staff in detail on WCAG compliance, and what developers need to do to achieve it. Q: Regarding the parallelogram and x-squared discussion, do any of the panelists have any concern about the cognitive load of provided accommodations? If so, what is a good balance? Also, is there an opportunity to leverage UDL or other approaches to mitigate cognitive load? I posed this question to Katrina Santner, a CenterPoint mathematics specialist with extensive expertise in making rigorous content accessible, and she agrees that cognitive load is an important factor to consider when creating engaging, standards-aligned content. In general, the more inputs –passage, graphic, question stem, answer choices – a student has to perceive in order to understand the question and the more interactions – scrolling, drop-down menus, drag-and-drop choices, text and equation editors – a student has to manipulate in order to respond to the question, the greater the cognitive load, all on top of actually solving the problem. Furthermore, the cognitive demands are generally multiplied for students accessing the content using accommodations. For example, consider students with blindness who must evaluate features of a graph by perceiving the information from a tactile graphic (i.e., the figure is created using raised surfaces so that a student with visual impairment can feel them) and the additional time and cognitive processes needed to comprehend the test question. We should keep in mind that the goal with online assessments is to measure what a student knows or can do, not their ability to scroll vertically and horizontally to access a passage, see a geometric diagram, or navigate a testing platform. While adding interactions can increase student engagement, we need to be both selective and purposeful in choosing these features. With universal design in mind, one can ask whether a specific-item type is truly necessary in order to assess the content, or are features being added as “bells and whistles” to make the tests more engaging? Balance the complexity of the text, table, or graphic with the number of interactions such as drag-and-drop choices, drop bays, and scrolling. When using multimedia or interactive features, ensure they are necessary to measure the targeted knowledge or skill. When possible, design items so that the entire content, including stimuli, can be displayed on a single screen. Avoid scrolling, especially items that require both vertical and horizontal scrolling. Q: Can you share any experience you may have in making assessment items accessible while maintaining the validity of the items? Have you had any issues ensuring that the test items still measure what they intend to measure after they have been made accessible? The issue of ensuring accessibility and maintaining the validity of academic standards is a struggle. Mutual understanding and collaboration between your entity that examines and matches standards with assessment content is a necessity. One of the more common areas where this is seen as being problematic is when preparing assessment content and question types for concepts that would be hard to teach without your visual sense being intact. Many tasks in geometry are typically thought of as being something that can only be taught with the ability to formulate the problem into a theorem or proof. For example, graphing, ordered pairs, and different visual/spatial concepts can obviously be taught using tactile instruction to students who are blind to establish concrete concepts that can then be shaped to more abstract thinking. If we are in the habit of understanding that there is only one way to present the information exchange between curriculum and student, we continue to struggle with this. I have heard it said that this results in a tendency to only use multiple choice question types and not have more interactive questions. My advice is to trust in your alignment and standards efforts and do all you can to make those strong. At the same time, it is necessary to gain an understanding on how we can present information in different ways and assess based on a person’s abilities and gifts and not get into the rut of interpreting our assessments as being so restrictive in how the student gains the content, expresses what they know and maintains their motivation to continue to succeed to in pursuing those standards and outcomes. I highly recommend the Universal Design for Learning Guidelines as a tool to assist people in understanding this conceptual shift. Got more questions? Send them to us at marketing@learnosity.com.